Linda Henry, wife of Red-Sox owner, John Henry, wanted to support urban agriculture and provide a healthy-food alternative to the standard hot-dog-and-hamburger fare that Fenway has traditionally offered. Gate A is located on the corner of Yawkey Way and Brookline Street, and for 100 years, the backside of the third baseline stadium looked down on Gate A's hot roof and air-handling equipment. 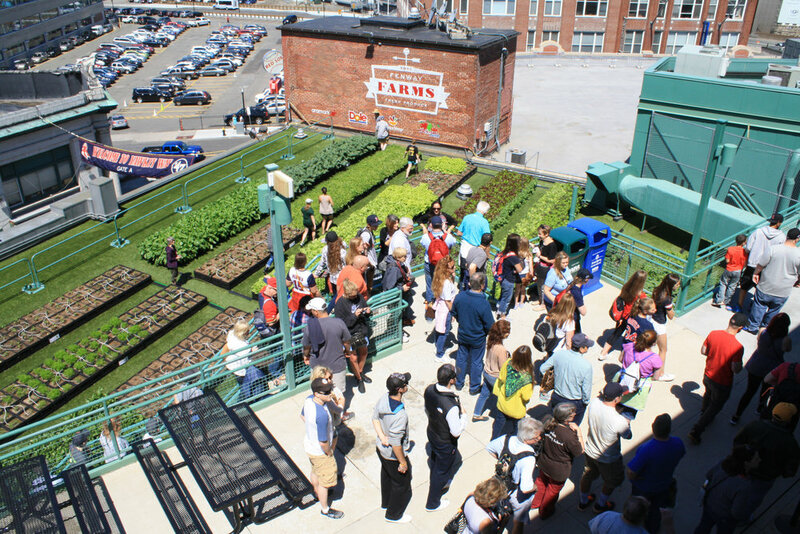 On April 13th 2015, Opening Day, fans looked down on a sprawling 5,000-square foot rooftop farm. Peppers, kale, and tomatoes replaced black rubber and grey metal; tens of thousands of onlookers couldn't believe what they saw. It has since become the most popular stop on the Fenway-Park tour, and the Huffington Post ranked it the number one great secret spot in Boston. In order to prevent the soil from blowing off the roof, we used milk crate-planters lined with fabric pots to hold the soil up on the roof. The milk crate square shape maximizes every inch of limited roof space and provides structural support for irrigation lines, trellising, and low tunnels without penetrating the membrane. Drip emitters distribute water directly to the roots and eliminate runoff. GCG harvested over 4,800lbs in 2015, and Fenway contracted planting of the adjacent roof in 2016. The mission of this project was to inspire the Red Sox community in Boston, New England and beyond, to celebrate health; individually, inspiring healthy daily choices and together, inspiring us to imagine what is possible to bring about healthier communities. With 2.9 million visitors each year, over 5,000 pounds of fresh food harvested each year, and Michelle Obama taking note: “six years ago, I don't think any of us could have imagined that Fenway Park would have a 5,000-square-foot farm on its rooftop to provide fresh produce for its fans;”. Judges praised the project’s ability to connect green roof technology with new audiences, and exceeding typical expectations for sports and commercial institutions.